Yesterday marked the beginning of our Advent celebration. But just one problem – no Advent calendar. Since we have this fantastic ebook Truth in the Tinsel this year, I wanted to make sure we had a calendar to use with it. I had dreams of sewing one, I had even pinned a couple ideas to my Pinterest board. (and p.s. I’d love it if you follow me ;) But I really should have started that in, like, July…. because let’s be honest, as the Queen of Procrastination, I’ve got enough on my plate with all the Christmas gift sewing I plan to do still. 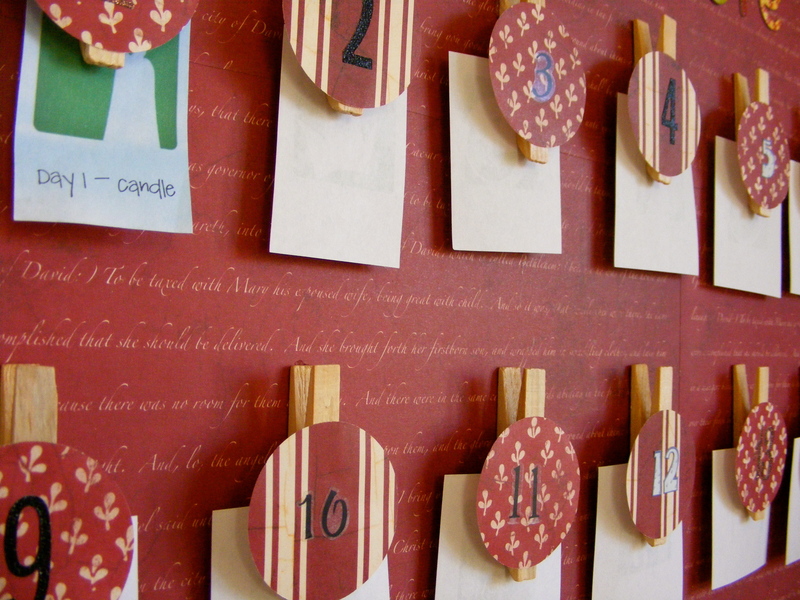 So instead of sewing, I put together a super simple Advent Calendar, made with materials I had on hand. 1. Glue scrapbook paper to the cardboard. I had three sheets of paper that display the words of the Christmas story from the Bible. I cut these to fit my cardboard. 2. Punch 25 circles out of scrapbook paper. Apply number stickers 1-25 on each circle. I didn’t have enough numbers from the same type of sticker, but I like the eclectic look of having different number styles. 4. Using hot glue [or the glue of your choice] attach your 25 clothespins to the cardboard in the arrangement you choose. 5. Apply one circle to each clothespin [I just used glue stick for this]. I found it easier to apply these circles after the clothespins had already been glued. 6. 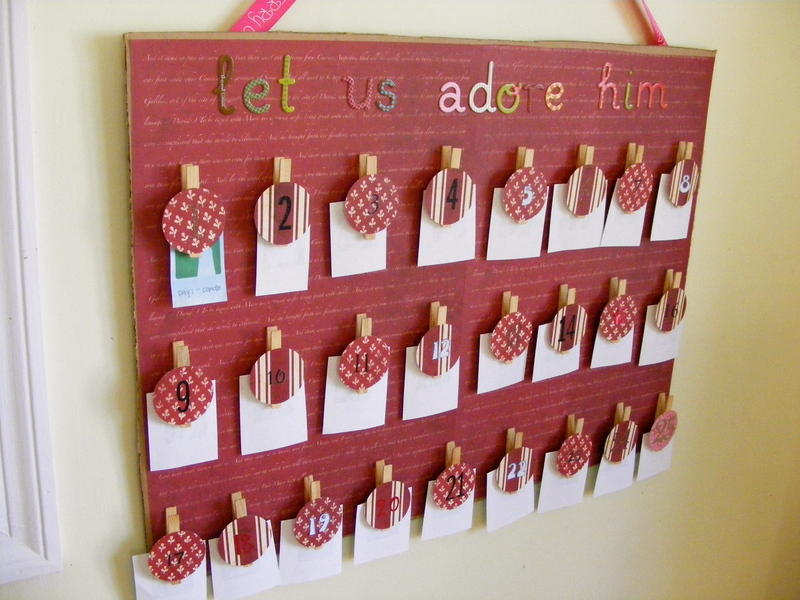 Using hot glue, attach ribbon to the back of the cardboard to use to hang your Advent calendar. That’s it! In each clothespin is a “clue” [from the Truth in the Tinsel e-book] that tells what ornament we will be making together on that day. 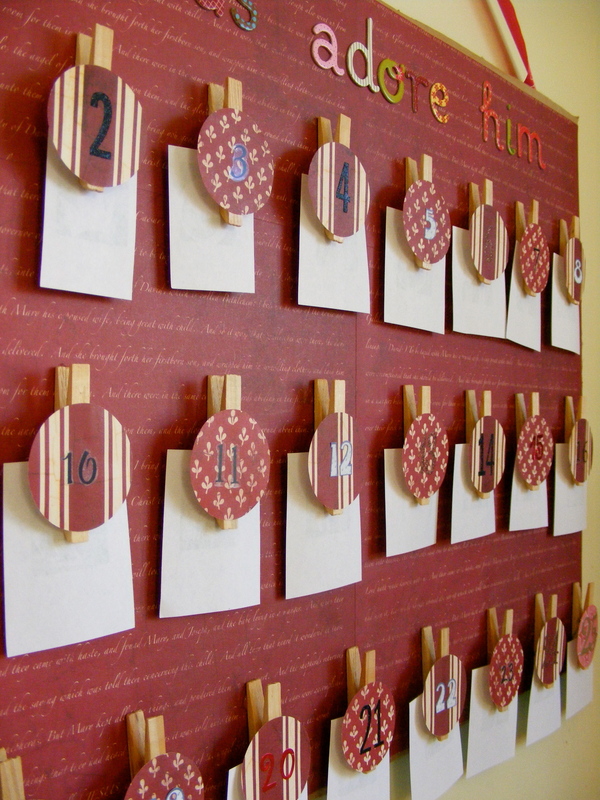 You could also clip an activity that you’d like to do that day, if that’s how you and your family celebrates Advent. 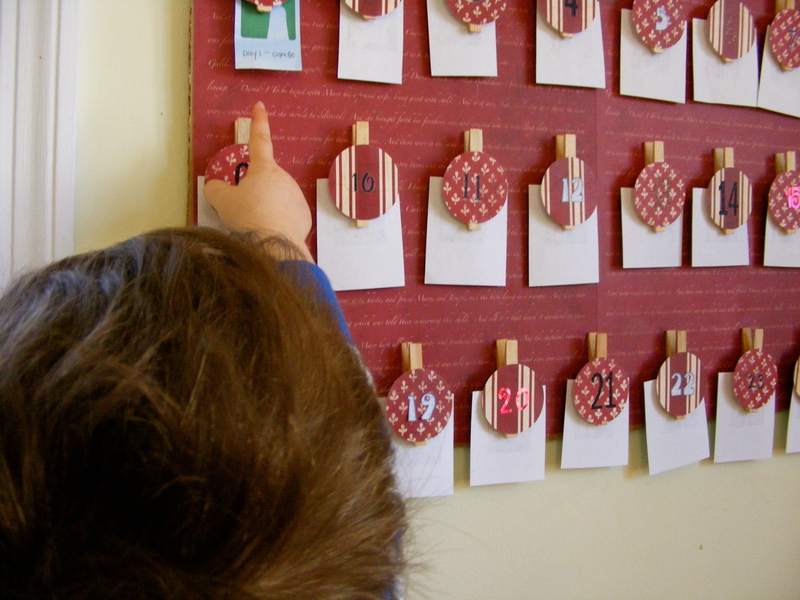 We decided to leave the clues clipped on the calendar, so that we could look back and remember which ornaments we already made. The boys are having a lot of fun and [hopefully] learning a bit in the process. I’m especially enjoying all the family time, since even the hubs is joining in! Do you celebrate Advent in your house? What kind of calendar do you use? Share the link, I’d love to see it! Owen helped me put it together and he’s really excited about it. oooh i like this a lot! Pingback: 21 Christmas Advent Calendars | events to CELEBRATE!